There is a fun new challenge posted at Caardvarks today. 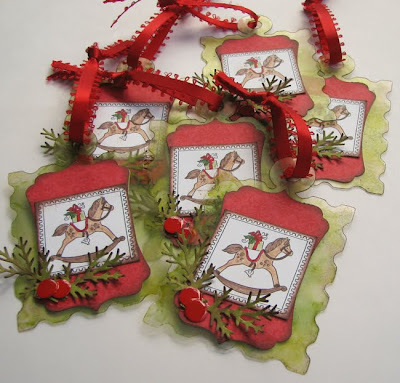 It is Holiday Tags and Minis. Caardvarks has teamed up with JustRite Stampers to bring this great new challenge to you. You can check out all the details and the wonderful prize up for grabs on the Caardvarks blog. I made some tags and minis for this challenge and I will share the rest of them with you over the next couple of weeks. I received the beautiful Hearts Come Home stamp set from JustRite and I created these fun tags with it. I used my Cricut and the Base Camp cartridge to cut out some clear tags in a postage stamp shape to match the edges of the stamped images. I then used some Tim Holtz alcohol inks to dye the clear tags green. I punched out the red patterned paper with a tag punch from EK Success and then I inked the edges with Cat's Eye Fluid Chalk I then layered it on the tag (with a matching one in the back of the card to write a little note) with the stamped and inked image and a couple of punched branches (Martha Stewart) and circles for the berries that I covered in Inkessentails glossy accent. I then tied a ribbon through the top loop. Wow, these are breathtaking! I love the use of the branch punch, I have it and hadn't thought ot use it this way. Christmas is my fave time of year!!! Love your gift tags!!! I really am enjoying your blog, and these are wonderful! !